Displaying 1 - 7 of 7 item(s) found. 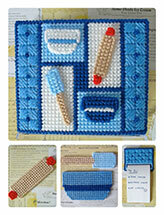 Design Specialty: Plastic canvas magnets and motifs, napkin holder covers and notepad covers. I like to utilize specialty stitches to help the project stand out. I took a class in Home Economics when I was in 9th grade. The teacher taught us many useful bits of information, but my favorite part of the course was when she taught us plastic canvas. I made a tissue box cover for my mom. She still has it! 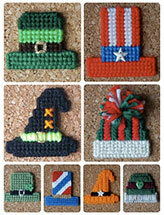 I really enjoy designing small, seasonal magnets and motifs -- items that have a lot of "replay value." 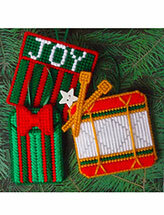 Whether making a fridge magnet, plant poke or gift tag, you have something that can be used over and over. I also like making utility items, like sewing notions, notepad holders and napkin holder covers, incorporating decorative stitches. 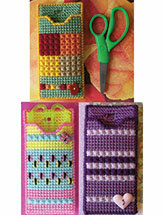 Plastic canvas magnets and motifs, napkin holder covers and notepad covers. I like to utilize specialty stitches to help the project stand out. I like to look around my yard, looking at the colors and shapes that occur in nature. I also enjoy spending time with items that elicit good memories: Christmas ornaments, amusement park tickets, art supplies. 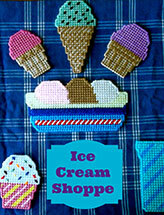 Ice cream has been known to inspire me or, at least, make the designer happy! I think that it is a tie when it comes to seasons. The sights, sounds and tastes of summer certainly make for inspiration. Winter's delicate snowfalls and the rich ornamentation that warm my home at Christmas bring about good ideas, too. My goal is to come up with at least one good idea a month. That puts me at a dozen ideas a year. However, I aim to produce even more items per year in the future. 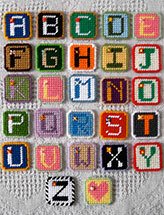 Living in an area known for its gorgeous quilts, I would like to learn some basic sewing- and quilt-making. 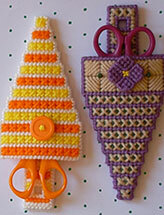 My Nonna wanted to teach me to crochet, but I was "not into it" as a young person. I regret not sitting with her and learning this beautiful craft. If it is autumn or winter, I am curled up under a blanket or afghan, glued to an NFL game (especially the Philadelphia Eagles). I am also known to consume a lot of snacks, play a lot of board games, and take a lot of naps. I feel most comfortable when I have beautiful shades of worsted-weight yarn, a plastic canvas stitch dictionary, and my homemade scissors holder "multitasker," holding my needles, pencil, ruler, and cutting blade tool, as well as scissors.